BERMEN DE LA MARTINIÈRE, CLAUDE-ANTOINE DE, officer in the colonial regular troops; b. 12 July 1700 at Quebec, son of Claude de Bermen* de La Martinière and Marie-Anne Cailleteau; d. 24 Dec. 1761 at Quebec. Claude-Antoine de Bermen de La Martinière’s father was a leading but impoverished citizen of Quebec, related, it seems, to the famous Duc de Saint-Simon. Shortly before his death in 1719, the father wrote to Saint-Simon asking him to arrange that Claude-Antoine, who was affected with the king’s evil (scrofula), be sent to France to be cured, and to provide for his son’s future, because he feared he was physically too weak to pursue any career. The letter does not seem to have received a response. Claude-Antoine, however, managed on his own. He recovered sufficiently from his illness to take up a successful military career, rising to the rank of second ensign in 1722, ensign on the active list in 1727, lieutenant in 1734, and captain in 1743. 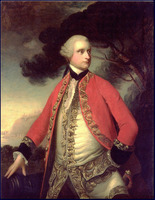 In 1737 he commanded at Baie-des-Puants (Green Bay, Wis.). Made a knight of the order of Saint-Louis in 1751, he served as commander at Fort Beauséjour (near Sackville, N.B.) for several months in 1754. After enjoying a distinguished record of service, he was forced to retire with a pension of 600 livres a year in 1755 because of ill health, and died six years later. He had married in Montreal in 1729 Hannah Parsons, by whom he had ten children. This Englishwoman was originally from Wells (Me.) and had been captured and brought to Canada at the age of two; on arrival there she was baptized Catherine. In 1763, not long after the death of her husband, she sold the only family property, the seigneury of La Martinière, adjoining the seigneury of Lauson, to Governor James Murray*, and went to live in France. The family name did not survive in Canada. AN, Col., D2C, 57, f.116; 61, ff.35, 166; 222, f.499; E, 251 (dossier La Martinière). “Une lettre inédite du gouverneur Duquesne,” BRH, XVIII (1912), 348. Fauteux, Les chevaliers de Saint-Louis, 151–52. Le Jeune, Dictionnaire. Tanguay, Dictionnaire. Coleman, New England captives, I, 410–13. J.-E. Roy, Claude de Bermen de La Martinière (1636–1719) (Lévis, Qué., 1891), 90–100; Histoire de la seigneurie de Lauzon (5v., Lévis, Qué., 1897–1904). P.-G. Roy, Fils de Québec, I, 157–58; “Une supplique de M. de Bermen de La Martinière,” BRH, XXXV (1929), 382–84 (contains part of a letter written by Claude de Bermen de La Martinière to the Duc de Saint-Simon). Edward H. Borins, “BERMEN DE LA MARTINIÈRE, CLAUDE-ANTOINE DE,” in Dictionary of Canadian Biography, vol. 3, University of Toronto/Université Laval, 2003–, accessed April 26, 2019, http://www.biographi.ca/en/bio/bermen_de_la_martiniere_claude_antoine_de_3E.html.